It is no secret that kitchen cabinets undergo a lot of wear and tear. From dirty, sticky hands to cooking grease, sauce splatters, and much more, these areas in the kitchen typically take a beating. Because things like food particles, dust, and grease build up on your kitchen cabinets and are challenging to remove, it is smart to clean your cabinets regularly. 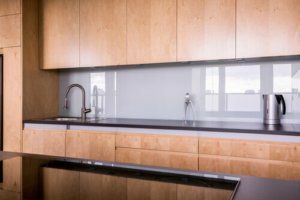 In fact, you may be surprised what an excellent scrubbing can do for your kitchen cabinets. Label the cabinet doors if you plan to remove them so that you can put them back in the right place. Note: the holes for the hinges must match. Wear gloves and eye protection when using strong cleaning products. Layout drop cloths to protect surfaces. Clean thoroughly, following the manufacturer’s instructions. Rinse the cabinets after scrubbing them and allow the wood to dry. Soak the pieces in soapy water for at least 30 minutes. Scrub lightly with a soft brush. Allow the hardware to dry. If necessary, apply the proper polish. If you need to replace any damaged or missing pieces, take one set with you when you visit the hardware store. However, if your cabinet hardware is old, it may be challenging to find an exact match. If this is the case, it might be time to shop for new cabinet hardware. Be sure to take some of your older hardware along to stores with you to ensure the new pieces will fit your existing cabinet doors. When selecting the hardware finish, think about what style will look best in your kitchen. If you prefer traditional, then brushed finishes, polished brass, or nickel will nicely complement your space. Or, if you have a more modern flair, select finishes with a glossy metal shine. If your cabinets still do not look spectacular after cleaning and replacing the hardware, enlist the help of a professional to reface or replace your kitchen cabinets. At Republic West Remodeling, we specialize in updating kitchen spaces, including cabinet restoration, replacing, and remodeling, as well as countertops, tile backsplash, and storage needs. Our highly skilled team of kitchen remodeling professionals have decades of experience, and we use only the highest quality materials, allowing us to provide our clients with results guaranteed to be sophisticated and durable. Call us today at (480) 428-2695 to schedule your free consultation!